A Trio of Bug Eyed Monsters. 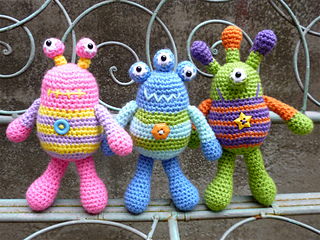 Here we have a colorful set of Bug Eyed Monsters, all ready to cause monster mayhem! Includes detailed instructions and clear photographs to help you create these crazy looking characters. Easy and quick to crochet. Fabulous for party favors, stocking stuffers, and general all round fun. Using worsted weight (DK/8 ply) yarn and a size C (2.75mm) hook, Bug Eyed Monsters will measure approx. 7” (18cm) tall.